As the CEO and Chairman of the Board of several companies related to eye health, Dr. Michael Lange is passionate about optometry and the link between ocular health and nutrition. His first venture was Lange Eye Care and Associates in 1993 in Ocala, Florida. Dr. Michael Lange now oversees nine locations across the state. He serves as the CEO and Chairman of the Board of Express Contacts and Express Sunglasses, two Internet companies offering replacement contact lens and sunglasses, respectively. In keeping with Dr. Michael Lange’s belief that patients should be educated and responsible for their own health choices, each site offers an extensive question and answer section. As owner of Fortifeye Vitamins, Dr. Michael Lange once again shows his commitment to helping people improve their health. The company’s express mission is to promote better ocular and general health through the right combination of vitamin supplements and nutrition. The company includes eight research centers spread across Florida. Dr. Michael Lange holds memberships in the American Optometric Association, the Florida Optometric Association, the North Central Florida Optometric Association and the Ocular Nutrition Society (formerly the Optometric Nutrition Society). He is also a member of the Gainesville Area Chamber of Commerce and the Ocala/Marion County Chamber of Commerce. 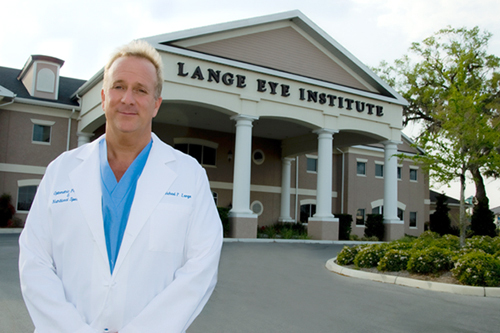 A graduate of the Pennsylvania College of Optometry, Dr. Michael Lange currently resides in Ocala, Florida. 3 Responses to About Michael Lange, O.D. Michael Lange optometrist in Ocala Florida was my first eye doctor about 20 years ago and ever since! I was first fit in contact lenses at Lange eye care in Ocala and dr Lange now states I am finally a candidate for LASIK surgery So I am scheduled for LASIK surgery in one month in the Gainesville Lange laser center. I am looking forward to no more contacts so here’s hoping . Michael Lange Optometrist in Ocala location on 200 across from the paddock mall has been my optometirst for the last six years. I had gone to many optometrists before finding Dr. Mike and they all said i could not wear contacft lenses do to the severe amount of astigmatism i have. Well i am wearing a specail rigid contact lens that enables me to be a much better tennis player and i owe it all to Dr. Lange for taking the time necessary to fit me in these special contacts that no one else would even attempt with me. I heard him on his radio show one am driving to work in Orlando and decided to give him a try. It is worth the drive to me!